Anthony Smith being presented with his level four Professional Tree Faller certification by Peter Clark during his visit to Skyline Harvesting Ltd on the 6th of December. 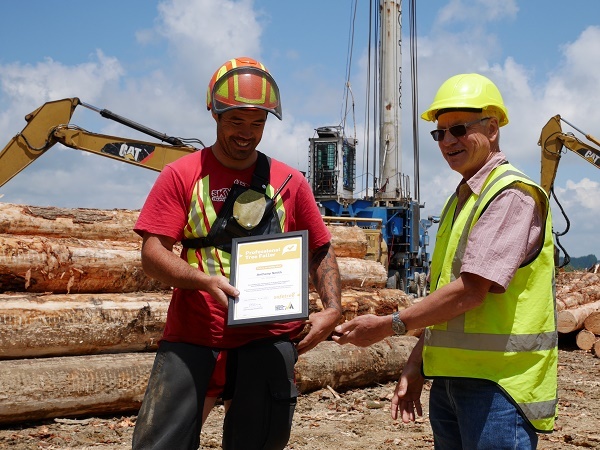 With PF Olsen support, Skyline Harvesting Ltd has implemented the professional feller certification programme. The programme confirms tree fellers at the highest industry competency, and is available only to experienced fellers, who have already demonstrated good technique and safe working practices. To attain professional certification a feller is evaluated often by several field assessments completed by an independent assessor approved to carry out the certification process. The feller must consistently demonstrate best practice, technique, felling knowledge and attitude to safety for themselves, their observer, and their crew. The safety systems of the contractor are also scrutinised to make sure they are to the highest standard to support the feller and the complete operation. This is not a journey to be embarked on lightly; it takes commitment, and we would like to congratulate Anthony on his success in joining this elite group.